Walking through the vineyard this afternoon I realized that reporting on the vines’ fruit-bearing timeline (i.e. which flowers bloom first, etc.) would not be possible. This is only year two for this vineyard, and our crew (mostly Nick and occasionally students) is pulling off the suckers and flowers and anything not pertaining to the growth of the two main shoots that we are training up to the wire. I suppose this affords me an opportunity to report that we are subscribers to the “spare parts” theory to growing vines in the Midwest. Rather than training a single trunk up to the wire, we’re training two. It is somewhat commonplace for a vine in the Midwest to suffer a bit of winter damage (or damage from a late freeze, chemical drift, drought, or a myriad of other elements), and we prefer to have two trunks in case one gets damaged or completely dies outright. Generally speaking, people believe two heads are better than one. Grape growers in the Midwest often extend that thought to vine trunks, two are better than one. As with last week, several slow starting vines are finally coming around. Jupiter now has 9 vines with leaves, up from 6 two weeks ago. Chardonnay now has 4 vines with leaves and some others show bud swell (popcorn). Valvin Muscat now has 8 vines with leaves with others swelling. Some varietals that are performing surprisingly poorly are Chambourcin, Traminette, and Vidal Blanc. The Chambourcin had only 5 vines with leaves last week; however the late frost knocked them back. Now only 1 has leaves with some others showing bud swell. Chambourcin is usually a slow starter in the spring, but spring is nearly over. Traminette and Vidal Blanc both are only showing some bud swell. Just 1 vine has leaves in the Vidal Blanc and zero in Traminette. Other observations are that both Norton and Regent are doing well for numbers of vines with leaves (11 and 12, respectively), but they are least vigorous compared to other varieties in the vineyard with shoots just 3-6 inches; whereas, Frontenac and Leon Millot among others have shoots 3-4 feet in length. The freeze event ten days ago certainly set back some vines, and I suspect it may delay fruit set and harvest. Last but not least, all 12 Cabernet Franc vines are showing signs of significant bud swell. Several interesting observations this week. Some are excellent news, and others are somewhat unexpected and unfortunate news. Going by the color photos in the second illustration on this website: http://i3dviticulture.pbworks.com/w/page/32285544/Growth%20Stages (the graphic was produced by Michigan State University), I noticed that many varietals have begun the process of growing the “Immediate prebloom” flowers which I’ll denote with “IP” in this entry. I’ll also list the number of vines with leaves or recently broken buds of the original 12 planted. The order of the listing is the order planted in the vineyard which isn’t alphabetical: Concord (12, IP),Jupiter (6, IP), Mars (12, IP), Neptune (2, IP), Suffolk Red (12, IP), Vanessa (12, IP), Cabernet Franc (0), Chardonnay (2), Gruner Veltliner (1), Lemberger (2), Riesling (2, IP), Zweigelt (2), Edelweiss (12, IP), Frontenac (12, IP), Frontenac Gris (12, IP), Lacrescent (12, IP), Lacrosse (12, IP), Marquette (12, IP), Brianna (12, IP), Chardonel (3, IP), Chambourcin (5, IP), Cayuga White (11), Corot Noir (12, IP), Fredonia (12, IP), Marechal Foch (12, IP), Geneva Red (12, IP), Glenora (8, IP), Leon Millot (12, IP), Marquis (12, IP), Melody (12, IP), Niagara (12, IP), Noiret (11, IP), Norton (11, IP), Regent (12, IP), Rougeon (12, IP), St. Croix (12, IP), St. Vincent (12, IP), Seyval Blanc (11, IP), Steuben (12, IP), Traminette (0), Vignoles (12, IP), Valvin Muscat (4), Vidal Blanc (0). A lot of numbers to read through. Here are a few observations. The vitis Vinifera are not doing so well. That is not completely unexpected given the harsh winter, but perhaps it’s too early to judge since they are not accustomed to this climate. Time will tell. The Chardonel and Chambourcin are also struggling. They are planted in the same row and are surrounded by thriving vines. Perhaps there is something in that row? Both are grafted to 3309 rootstock, so perhaps something there is causing the issue. Perhaps the valve controlling water in that row malfunctioned last year? Hard to say. Traminette, Vidal Blanc and Valvin Muscat are all on the edge of the field. Perhaps there was some chemical drift? Perhaps the soil there is poor? Perhaps something else is going on that I’m not seeing? They all did great last summer/fall, so it’s something of a mystery at this point. Finally, the table grapes Jupiter and Neptune are not doing very well either. They are in adjacent rows in the vineyard. Generally speaking, over 95% of the vines showed excessive vigor and tremendous growth in the first year. It is worth noting that we didn’t officially list any observations last year knowing that much of the growth in a first-year vineyard is the result of nursery conditions as much as on-site conditions. However, one thing that is worth noting is that the Seyval Blanc vines are now producing huge numbers of flowers. Last year the Seyval produced a heavy crop of berries which were stripped off in early July. Upon returning to the vineyard after harvest we found another entire crop of Seyval berries had developed. Of course, those were immediately stripped off as well. Just about every vine is now “awake.” The varieties that merely have begun to show the “popcorn” stage of bud swell are Chambourcin, Chardonel, Chardonnay(v), Cabernet Franc(v), Gruner Veltliner(v), Lemberger(v), Traminette, Vidal Blanc, and Zweigelt(v). One vitis Vinifera varietal has full leaves on some vines, Riesling. Corot Noir, Melody, Norton, and Valvin Muscat are now at the bud break stage, but leaves haven’t opened yet. The most vigorous varietals at this point with shoots of six inches or more are Lacrescent, Mars, Edelweiss, Frontenac Gris, Geneva Red, St. Croix. Marquette has shoots over 12 inches. It’s not surprising that these varietals are growing fastest as they were developed for a shorter growing season. One thing to note is that the vine rows are not growing uniformly. That is to say, some rows have vines with three-inch shoots while others merely have buds beginning to open and still others have shown little to no growth at all. It will be interesting to see which vines have or have not survived the winter. Most of the vines are either experiencing bud swell (white fuzzy buds, like popcorn or mini-popcorn) or bud break (leaves). 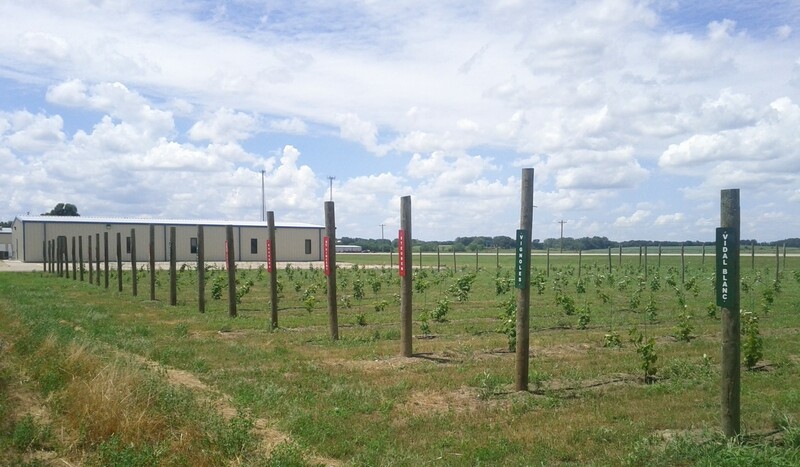 The vines with leaves include the varietals Brianna, Concord (s), Edelweiss, Frontenac, Frontenac Gris, Geneva Red, Lacrescent, Lacrosse, Leon Millot, Marechal Foch, Marquette, Mars (t), Rougeon, and St. Croix. The varietals that do not appear to have begun bud swell yet include Cabernet Franc (v), Chambourcin, Chardonel, Chardonnay (v), Gruner Veltliner (v), Jupiter (s), Lemberger (v), Neptune (s), Riesling (v), Traminette, Valvin Muscat, Vidal Blanc, and Zweigelt (v). That the vitis Vinifera are not swelling yet is not a surprise. Also not surprising is that the varietals developed for northern states such as Minnesota and Michigan are among those varietals with leaves.